We've been planning to do a monthly newsletter for a long time, but with the move to the north bay and all the gardens we've installed the last couple years, we haven't had time to focus on much beyond the day to day demands of keeping all our gardens growing and our clients happy. Fortunately, the project wave is ebbing, we're doing fewer new installs, and our work load is gradually becoming more manageable. We'll be publishing a monthly newsletter from here on out. In the regular monthly issues, we'll post seasonal gardening tips, photos and insights from our gardens, and ideas on what to do with all your garden bounty, including recipes. From time to time, we'll post special issues focused on a particular event. This is one of those special issues. 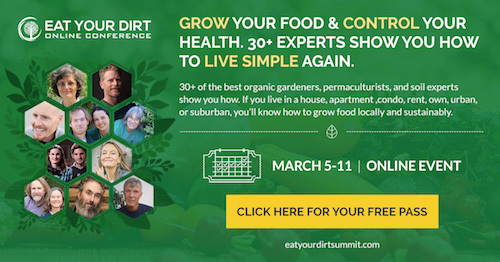 I was recently asked to be a speaker in an online organic gardening and sustainability conference, the Eat Your Dirt Summit. The conference goes live March 5-11, 2017. I'm looking forward to this conference not just as a speaker, but as a participant as well. I've been growing food organically for over 30 years, but this is an all-star cast, with expertise in topics I've been curious about for years, but know little about...I'm going to learn a lot from these talks. The Summit features 30 distinguished experts in Edible Landscaping, Soil Health, Organic Gardening, Permaculture, and Sustainability. YOUR FREE PASS gives you rolling 48-hour access to ALL the conference content, including round table discussions, live Q and A sessions, and other live events throughout the week. Topics range from the soil food web and enhancing soil to composting, vermicomposting, permaculture and food forest design, hugalkulter, edible landscaping, growing organically, and living sustainably. Featured speakers include Dr. Elaine Ingham on the Soil Food Web, Anne Bikle and David Montgomery, authors of The Hidden Half of Nature, permaculture authorities Paul Wheaton, Michael Judd, Amy Stross, and William Horvath, urban homesteading designers Sarah Sailer and Carleen Madigan, and author Grace Gershuny, among many others. On Monday, March 6th, at 6 pm EST (3 pm PST), I'll be speaking on Container Gardening and Growing in Raised Beds. I'll also be participating in Two Live Q & A Sessions on Monday, March 6th at 11 am EST (8 am PST) and Thursday, March 9th at 3 pm EST (Noon PST). Call with Questions! With the Free Pass, you can watch any of the talks for up to 48 hours after they air live. If you like what you see and would like anytime access to the entire conference, you can purchase an All Access Pass. If you have other gardeners in your life who might be interested in this conference, please forward this email to them to let them know about it. You won't want to miss this conference! Get your Free Pass Here!